LifeStation offers affordable medical alert systems backed by reliable monitoring and a no strings attached 30-day money back guarantee. As a medical alert company with products priced at less than $1 per day, LifeStation deserves our "Best Value" award. Overall, LifeStation stands out not only for its affordability, but also its month-month service agreement, ease of setup, straightforward product selection, and commitment to maintaining US-based monitoring centers. LifeStation excels at offering affordable, no-contract medical alert systems. Customers should insist on Mobile with GPS to receive the full benefit of available technology. 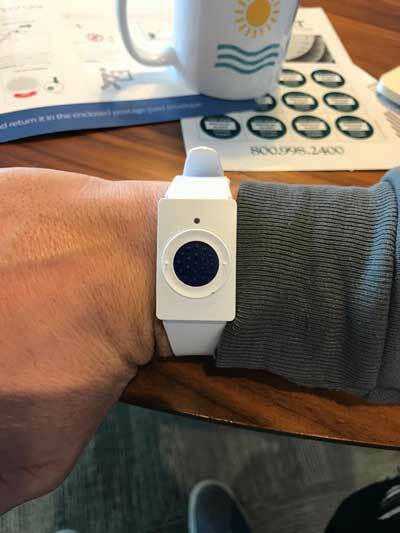 When we received a LifeStation medical alert system in the mail, the first thing we noticed was the instructions on the box “open here to get started.” Inside the box was the In Home Plus base station, wristband, power supply and a setup guide. The setup process is really intuitive, but the printed setup guide included a helpful five item to do list with easy to understand directions. In less than 5 minutes, our device was set up. We simply plugged in in the base station, put the wristband on, and pressed the help button. On the other end, a monitoring center associate answered and help with the activation process. How does a LifeStation alert system work? Once you have setup your LifeStation medical alert system, you can call for help by pressing the help button on either your wristband or pendant. Some systems, like the one we tested, have a required base station with an additional help button. When you hit the help button, you are connected with the LifeStation monitoring center. The monitoring center can call for emergency help (911) if the user needs help, or alert a caregiver. Similarly, if you fall while wearing a LifeStation pendant with fall detection, the alert system will contact the LifeStation monitoring center and dispatch help as needed. LifeStation offers three system types, based on your connectivity needs: 1) In Home Traditional, 2) In Home Plus, and 3) Mobile with GPS. In Home Traditional, the most affordable of three systems, is designed for customers that have landline telephones. In Home Plus systems are designed for users who do not have landline telephones. To make calls, the Plus system uses its own cellular connection to complete calls to the monitoring center (you do not need to provide your own cellular plan to use this service). The Mobile with GPS unit functions in the same way, but isn’t tethered to a wall power supply and instead uses it’s own rechargeable battery. We recommend the Mobile with GPS system because it can not only be used on the go, but allows the wearer to communicate directly with the LifeStation monitoring center without the need for a base station. LifeStation alert systems rely on creating a phone call between you and a call center, so your telephone network connectivity determines which product is best for you. The Mobile with GPS device is best for nearly all users with the added bonus of being able to take the medical alert system on the go. If you don’t need that functionality, or want to save some money, one of the the In Home systems is the best choice for you. Users with landline telephones who live in an area where cellular reception is questionable should choose the landline option. ** Mobile with GPS is operable within the AT&T cellular network. If you are using an In Home system, the next decision you need to make is between a wristband or a pendant. In general, the wristband is a good choice. It’s comfortable enough to be worn without being noticed, and should be easily accessible in the case of an emergency. If you want to add the optional fall detection feature (+$7/Month), you’ll need to use a pendant. Both devices are waterproof and have similar operating range. The prices for LifeStation’s medical alert systems will vary based on the unit you select. As with most other medical alert systems, the systems are rented (rather than owned outright). You will pay a monthly fee for the service. It’s common in the industry for medical alert companies to require customers to sign lengthy service agreements. However, unlike most of its competitors, LifeStation will allow you to pay month-month. While you are not required to keep the device for a long agreement, like any rental service you do have to return the equipment when you have finished using it. There is no termination fee to cancel using a LifeStation product, but you do need to provide 30 days’ notice. Their price guarantee locks in your monthly price, so you can be assured the price will not increase. Taxes are included in the monthly fee. One of our favorite benefits to LifeStation customers is the 30-day money back guarantee. If you want to test the product and make sure it’s right for you, you can request a device to be shipped to your house without risk. There are no fees to return the device, as long as you do so within the first 30 days. LifeStation demonstrates its committed to rigorous testing and system operability by conducting weekly automated silent tests. 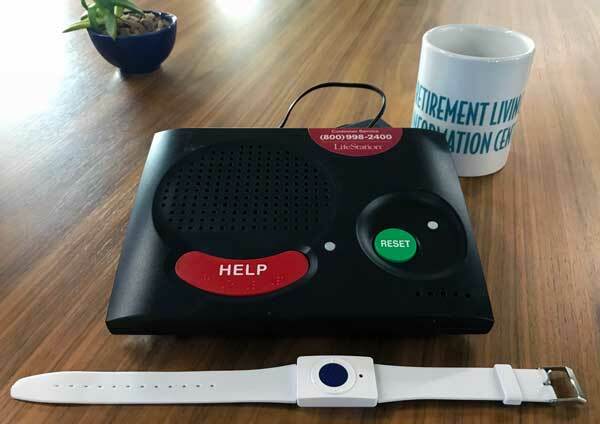 In addition to the automated tests, LifeStation encourages users or caregivers to conduct their own system tests by using the help button and talking with a monitoring center representative. LifeStation owns and operates two UL listed US-based call centers. Their UL status, which stands for Underwriter Laboratories, indicates that LifeStation’s monitoring center should be operational even in the event of a power outage and meets UL’s strict maintenance standards. LifeStation has committed to keeping their call monitoring center staffed by humans – not machines. In addition to the fall detection service, LifeStation offers an assurance plan for their equipment, a lock box, and additional buttons in either optional wall mount form or pendant/wristband form. The LifeStation assurance plan functions like insurance for the alert system so that if it is damaged, you will not pay for the full replacement cost of the system. The lock boxes work with a keypad to allow caregivers or emergency first responders the ability to enter your home with a house key, rather than by damaging the home. 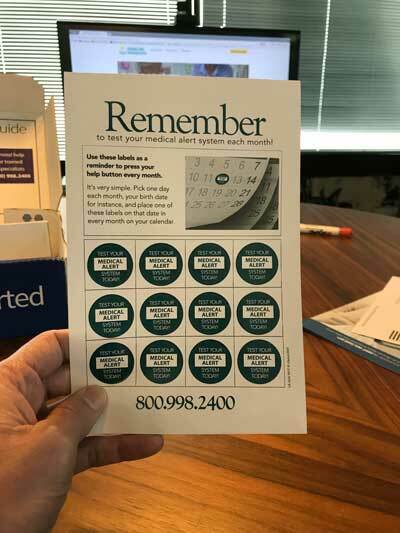 Additional help buttons can be worn or used by others in the house, which could be useful for either caregivers or seniors to call for help. Each of these optional accessories is priced for an additional monthly fee. We recommend choosing as many of them as you can afford, considering they help you avoid large unexpected costs or increase the usability of the system in the case of an emergency. What if the user can’t speak after pressing the help button? 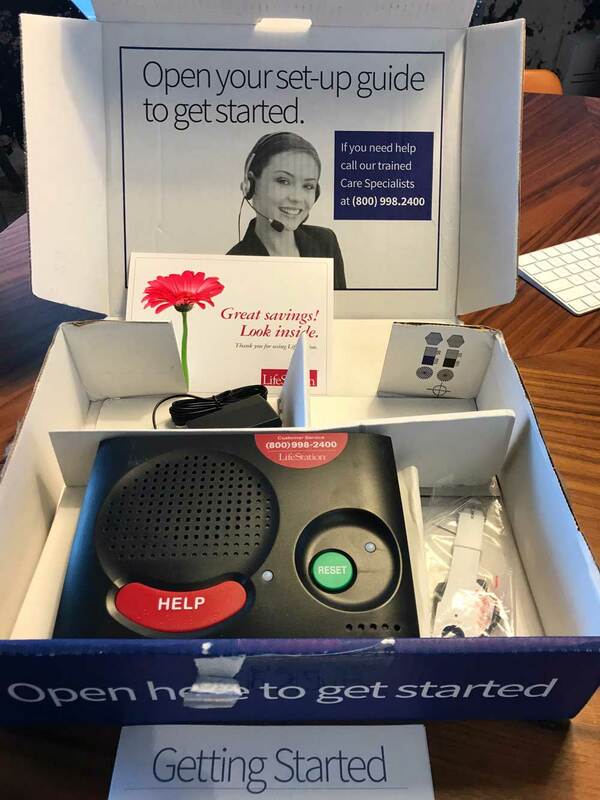 In the event a user presses the help button and is unable to speak to a LifeStation call center representative, it will trigger a pre-defined action plan. You will work with LifeStation to develop this plan. Common action plans are to first ask a neighbor or loved one to try to make contact with the medical alert system user. Calling first responders (911) is usually the last step in an action plan, although it may be the first. If you want to upgrade your LifeStation system, you can do so at any time. You will be required to return your old system and repeat the activation process for the new system. There is no fee to upgrade your system, but the monthly fee will increase if you choose a more expensive system. What is their money back guarantee? The LifeStation money back guarantee is for 30 days from purchase of the product. If, within the first 30 days, you decide to return the medical alert system for any reason, you will receive a full refund. There are no additional restocking fees or other fees to exercise the money back guarantee. Both the LifeStation pendant and wristband are waterproof. The base station, however, is not. In 2017 the company upgraded their systems. The Mobile with GPS system lasts up to 5 days between charges. For the In Home systems, the batteries in the wristbands or pendants should last the life of the system. In the event a battery is nearly depleted, LifeStation informed us they would identify the problem with their weekly silent test, and ship a replacement. Your system should arrive by mail in 2-3 days. Considering the ease of setup, affordable pricing and the variety of product options available, LifeStation is a good choice for a medical alert system. If you are interested in using one of LifeStation’s products you can call 877-728-1641 or use their online order form.